DCC Wiring Experiences: September 2014 - January 2016. 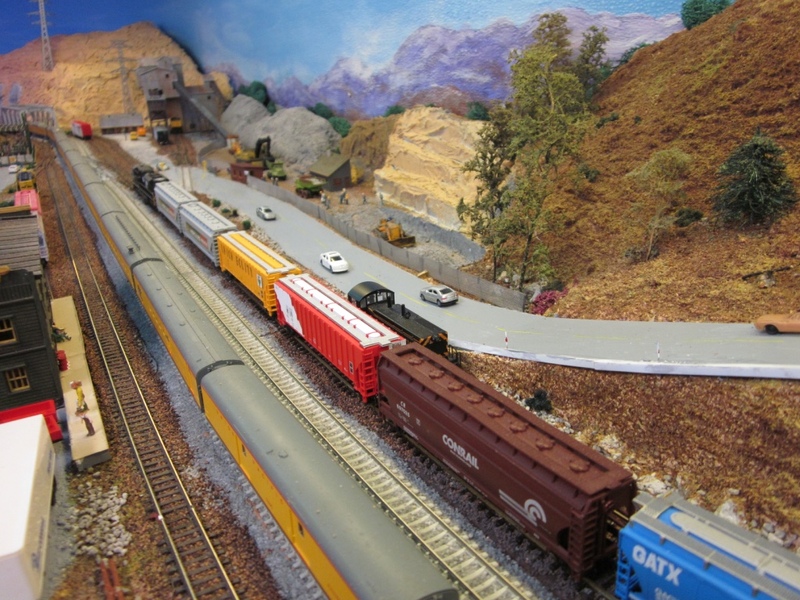 Well we now have the staging completed, mainline track to Gleeville and Summit running. There is also track around the mountains - supported by the spline roadbed. Here are some photos of the track and trains running, including the sound equipped Kato Mikado. This will be the entrance to Summit across a bridge. This is a bigger view of Summit where there will be a gravel mine and loader. If you look closely there is some complicated track work behind the diesel, including a crossing - all switched successfully by the Tam Valley Frogjuicer. Here is a mock up of the mountain area where I plan to install a Central Valley bridge over a large ravine. This is the exit of Summit. Eventually the highway will cross the tracks here and head down to the gravel pits and mine in Summit. Trains ran well when supported directly from the Power Booster, but I wanted to put in a block detector. The staging tracks, which are a return loop circuit are on a separate booster and controlled by an NCE EB1 Isolation Circuit. They have tested and run well. When I added the NCE EB3 Power District Isolation Circuits between the Booster and the tracks, I started getting shorts. I had planned the Gleeville and Summit area as an isolated section protected by the NCE Power Distrist Isolation circuit. Isolating the problem involved several calls and visits to the hobby shop, and much testing. Here are some of my lessons learnt over the last few weeks. Interestingly most of the lessons were known before I started but I skipped some checks much to my avail. 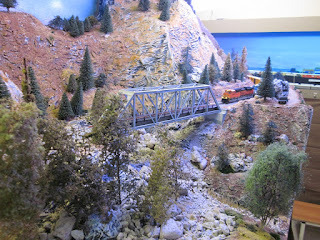 Also Gary Spencer-Salt, the Australian NCE distributor at Model Railroad Craftsman, has been excellent in support. In previous blogs I described how I made the Peco Electrofrog switches more DCC friendly. I isolated the frog by cutting the frog rails below the frog with a micro saw. I then filled this gap with plastic strip held in with Super Glue. When dry the plastic was carved to match the rail. Later it will be painted. I also connected wires from the outside rails to the stock rails. One thing I failed to do with the first few switches was to check all the soldering to ensure good connections. I found several solder joints that were not electrically connected. Whoops - a big NO NO. Also I discovered one isolated frog that was not isolated. The gap had plastic to isolate the joint but some metal had found it's way in as well. Whoops again. So part of the production process must include electrically checking everything. Also remember to move the switch and check the electrical isolation and connection. I use a simple circuit with buzzer and 9 volt battery to check for open circuits. It takes only a few minutes but can save hours of work and re-doing later on. You can use any multimeter or similar to check all the connections before leaving the workbench. After a few weeks one of my switches started faulting / shorting on one direction only. It worked perfectly before installing and for the first few weeks. I removed the switch and re tested it. The wire from the frog had become bare or was already bare and pressure on the switch from cleaning had forced the bare wire to touch one stock rail. This was rectified but alerted me to another issue to watch out for. One lesson is to NOT solder the switches to the other track, so it is "easy" to remove a switch in the future if required. Most user forums and DCC blogs (e.g. Alan Gartner's Wiring for DCC is one of the best) recommend building a simple buzzer driver by a 9 volt battery to test for shorts. This is a MUST! not have the bus wires connected to the booster at this stage or you will get a short signal. not have any locomotive on the track or that will also send a signal back. Not have the Frogjuicers connected at this stage. Also use this tester as you connect every power feeder to the bus wires. As you connect if one wire is connected the wrong way or shorts some other way (e.g. touches a bare bus wire) the buzzer will sound. Unless you have a small layout you need separate circuits (separate power districts). If you do not then any short circuit will bring down the entire layout. Power Isolation circuits enable a short to occur and only affect that district. If the short was due to a metal object across the lines and you then remove it the power district controller should right itself again. I have 7 main power districts all controlled by circuits. There are easy to set up. Separate bus wires goes from each of the 7 circuits around the layout. All are different colours to ensure no foreign connections. You can substitute an automotive light bulb instead of the Power District circuit breaker and save money. The Gleeville and Summit area of the layout is the farthest from the Control Unit and Booster so there is a long (about 9 meter) bus running to the area which is then split off into three sub buses. Running the Isolation Circuit back at the Power Booster / Controller continued to give shorts. So I experimented with twisting the 9 meters of bus wires and connecting the 3 section isolation circuit near Summit. This worked so I have purchased another 3 isolation circuit protections. The NCE EB1 and EB3 Circuit Protectors are programable. You can program the trip time from the NCE controller. You can also change the trip current from 2amp all the way up to 6-8 amps. It is not recommended to go beyond 4amps. On two sections I have set the circuit to trip at 4amps. This is done with "shunts" on the EB1, EB3 boards. Currently I have everything working so do not plan to make any further tuning of the circuits. However - who knows? One of the issues with DCC is there are more things to change and hence more things to complicate the overall flow of electricity, and signals. Even with 7 power circuits each circuit is a large section of the railroad with many switches and sections of track. If you plan to add signals later you need to sub divide the sections. I do plan to add signalling later. Even if you don't plan to signal the layout it is advisable to sub divide the power districts into sub districts. You only need to create a sub bus across one of the bus wires. These sub buses can be protected with an automotive light globe which will light if there is a short. The advantage of sub buses is the ability to isolate sections in the case of faults. It is advisable to make all connections between Boosters, Bus Isolation Circuits, and Sub Buses with screw terminals. Some folks recommend also adding switches in the circuit so you do not have to unscrew every time you are checking a circuit. I have done this and have 8 "on-off" switches on the fascia near each power district. If I get a short that does not reset immediately, I switch off just that district and turn it on again. This usually fixes the problem and I have not had to disconnect any leads. A good investment to install these on-off switches. From the bus and sub bus to the track there are two proven ways to connect. Strip a section of the bus wire and wrap the track feeder to the bus. Once this works then solder that connection. I use a small motor mechanics gas lift stool on wheels to get under the layout shelves to solder. Insulated Isolation Connectors are another way of joining wires. You need to get the right size for the wire you use. The connection is simple and quick by placing the connector over the wires and crimping the connector. 3M is a major supplier and auto suppliers and electronic suppliers (like Jaycar) also sell them. Here is the diagram to wire up the programming tack and switch. I have two programming tracks. 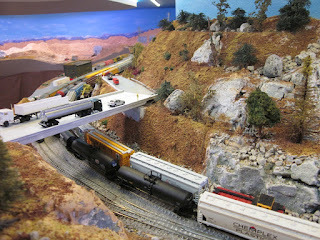 One is a long siding on the layout near the Command Station. The other is on the workbench. This latter has a DPDT switch to swap to my "SPROG" to use DecoderPro etc. If you have more than a few locomotives in DCC get a Sprog and use DecoderPro. It helps speed matching and also stores all your locomotive specifics. So if for some reason - and it will happen, you lose the previous program for your locomotive you can download it easily. It also becomes an excellent asset list of your key investments. I have two reverse loops plus the engine terminal / turntable which makes three. Following experiments with many products I have settled on Tam Valley Dual FrigJuicers as my controllers. They automate the reverse loop beautifully. One lesson I learnt the hard way is to make sure the reversing section on the layout is as long as the longest train. If part of the train is still on the main whilst the other end re-enters the main in the other direction you can get faults. I had to modify my track work in one section to fix this problem I created. DCC is terrific. It can also be frustrating if you cut corners. Use meters, or buzzers to test every connection and every switch at the workbench before installing. Also a RampMeter that measures track voltage has proved valuable. It will tell you the voltage everywhere on your track. In my case I had a faulty System /One Command station that was putting too much voltage onto the tracks and causing some of my early errors. It was 18 years old and replaced with a new NCE Command Station. 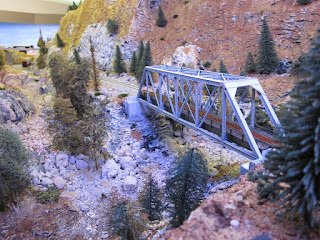 After several months of running successfully, the scenery and ballasting has happened across several areas. Here are today's pictures of the mountain area and Summit.